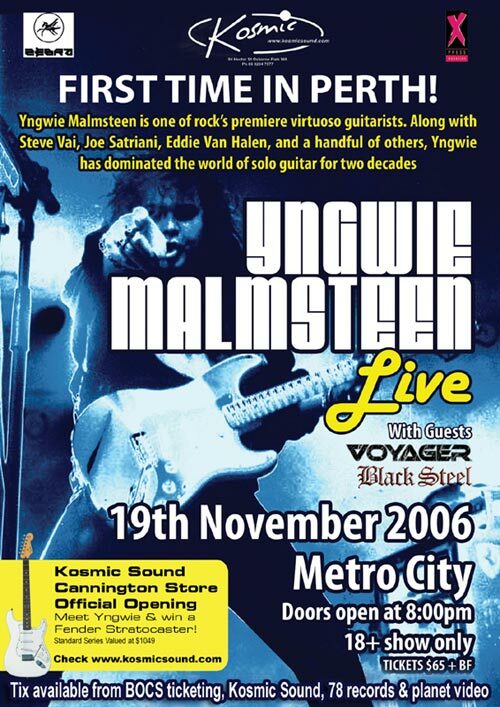 Yngwie Malmsteen is one of rock's premiere virtuoso guitarists. Along with Steve Vai, Joe Satriani, Eddie Van Halen, and a handful of others, Yngwie has dominated the world of solo guitar for two decades. 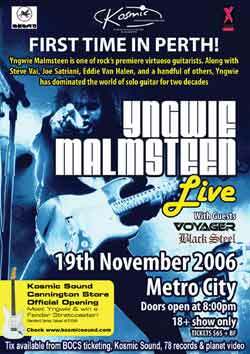 Yngwie Malmsteen's Rising Force "Unleash The Fury 2006" tour is hitting Perth on the 19th of November at Metros City, and thanks to Playing Up Promotions we have a special offer for Western Front members. If you have already signed up you would have received an email telling you about the offer - present a copy of the email at the door and you can get $15 off the door fee (Normally $80)! If you aren't yet a member but would like to take advantage of the special deal just register and drop me an email asking to be sent the offer. It's as simple as that. Look forward to seeing you there for a night of insane shredding and riffery. Just added a review of the awesome Cannibal Corpse show in Perth recently done by Ivana Luketin. General consensus is it was a great gig and thanks to Soundworks for bringing them down to Oz. Go here to read the review. Also, I'll take this opportunity to mention that Western Front is looking for contributers for doing reviews of gigs and releases, and possibly interviews as well. If you feel you are up to the challenge then contact me via the contact form .